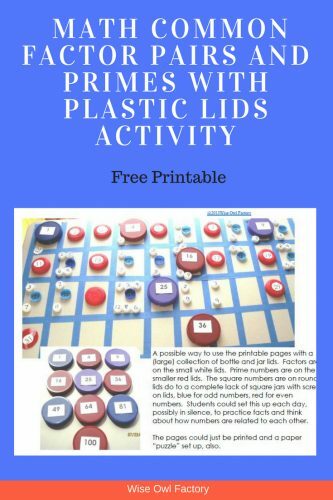 This post has a free math chart with primes, squares, composite, and factor pairs facts with plastic lids activity for a unique view of prime numbers, square numbers, composite numbers, and factor pairs. 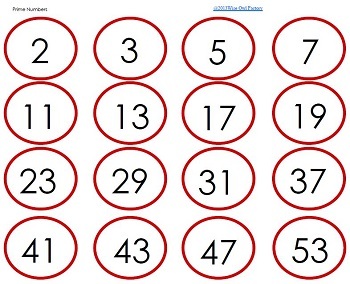 The printable will help create the necessary numbers for this learning. 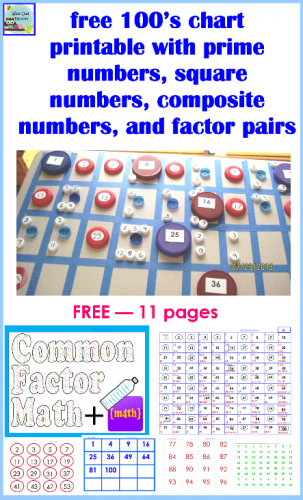 My free printable today is an activity-based 100’s chart that can also be used while solving math problems. Although I’ve been thinking about making this printable for a long time, I still don’t have enough plastic lids to make the entire 100’s chart. I hope from the photo you can get a sense of the idea for this activity for students. I would suggest trying to collect enough lids for the whole chart or using paper numbers from the printable. I made the different categories of numbers in different colors to help students place them correctly, and think about what the chart is showing. It is quite interesting to see the numbers this way, and students will have many observations about the chart. The printable chart could be used without the activity, but I think working with the numbers as a chart will assist students in seeing what they are working on in math. Higher grades could continue the chart to 200 or 300 to see even more patterns. Here is a sample of one of the pages, the first prime numbers page. The circles could be cut to place on plastic lids.